Auto Crisis, from developer Baraboom, is a touch-controlled racing game that proves that a fun concept, 3-D graphics, and unique controls do not make a great game. Instead, Auto Crisis is a frustrating and poorly designed exercise in how not to make a compelling iPhone game. Right away, it’s clear that the developers had simplicity in mind when creating the game. The welcome screen features the game’s logo with a trophy for tournament mode and a stopwatch for time trial mode. They’re not labeled, of course, so that’s something you have to figure out on your own. The next step is to pick the color of your car. You slide your finger along a color gradient to pick the exact shade you want to paint it, which is a unique feature to be sure. In fact, the 3D look of the game is appealing in general, but it doesn’t make up for the game’s shortcomings. Unfortunately, once the race itself starts, the problems begin. You drag your finger along the screen to steer; there is no obvious tutorial for this, but you can tap the “i” button on the home screen to see a diagram of how the controls work. 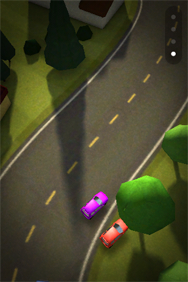 A recent update offers some basic instructions on how to drive, but this doesn't mean driving is any easier. Once you’ve figured out what mode you’re in and how to control the game, it’s an unwelcome surprise that the touch controls barely work. I tried holding my finger in front of the car, hoping it would follow me, with little success. You can hold your finger down on top of the car, and this works better, but the friction is uncomfortable and the steering is still wonky. And once you’ve smashed into something, it’s ridiculously hard to back up and turn around. An onscreen touch-pad, joystick, or even accelerometer controls would be much better. You can also pick up weapons on the road to fire at opponents, but you have to tap the top-left of the screen to fire them. Once you take your finger off the screen, you stop driving forward, so you have to quickly fire and then move your finger back to the car to keep driving. In the end, it was more efficient to keep driving than to try to slow down the other racers. If you’re in the mood to spend some real time mastering Auto Crisis, then it’s for you. For those with less patience, it’s probably not even worth the 99 cents. There’s nothing wrong with taking the iPhone game back to basics, but this game just doesn’t get it right.